Looking for that extra boost of bass to keep the D&B crowd from slowing down!? 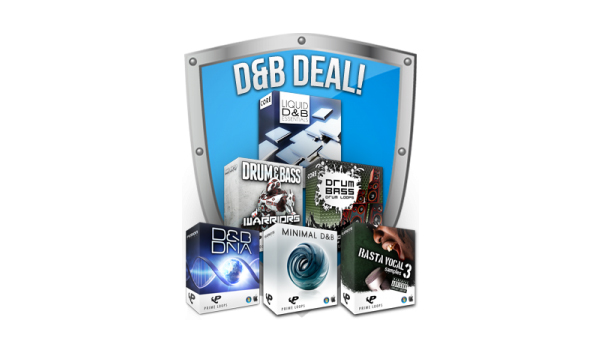 Then you need to get your hands on our latest load of prime sample content, the massive ‘D&B Producer’ Bundle! Peek inside and you'll find all you need and more to make that next club smash! Mixing together no less than 6 epic sample packs from amidst our bulging catalogue, you'll find sonic inspiration in the form of electrifying leads, quaking sub basslines, monster SFX and hits, and of course, those indispensable drum breaks! - 350MB of timeless liquid funk D&B samples, featuring energetic drum loops, organic sounding instrumental loops, warm analogue synth chords, deep D&B basslines & more! - 365MB of next level D&B! Featuring Bass, Drum, Synth and Pad loops for a sonic assault that will really twist your head! - 530MB+ of spacey, intricate and sophisticated D&B, from ultra detailed drum, percussion & FX loops to super sub basslines, lush pads and pristine synth leads! - Massive collection feat. 100+ Drum Loops, 130+ Bass & Synth Lines, 140+ Patches as well as 200 One-Shot Drum Samples for maximum impact! - Huge collection of over 280 blockbustin', royalty-free Rasta Vocal Samples and Patois Shouts, all ready for instant download in supreme 24-bit audio quality! - 100 straight-up DnB Drum Loops, Beats & Breaks, what more could you want?! At an indulgent 2 GB+, this combo deal really is value for money. If you're looking for an entire treasure trove of D&B pleasure, then you know what to do!